I love vanilla! I love chocolate! I loved baked goods! Using quality organic ingredients not only is better for your health and the environment, it also bumps up your cooking to a whole new level of gourmet! 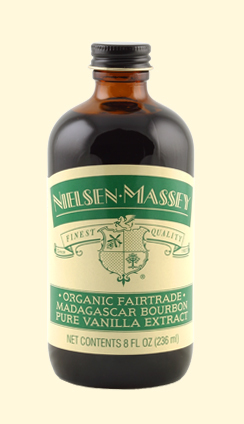 Our Organic Fairtrade Madagascar Bourbon Pure Vanilla Extract offers the same outstanding flavor and high quality as our traditional extract, but features only certified organic and Fairtrade ingredients. Made using our proprietary cold extraction process, this is an exceptional “all-purpose” vanilla that’s ideal for general cooking and baking. Add this sweet, creamy and mellow extract to any recipe in which you desire the undeniable flavor and aroma of pure vanilla. Fairtrade Canada, a national, nonprofit Fairtrade certification organization and member of Fairtrade Inernational, is responsible for certifying the beans we use. Fairtrade certified vanilla ensures that small-scale farmers in developing countries receive a fair price and use sustainable farming practices, stabilizing vanilla-producing communities and protecting the environment. It also ensures a consistent supply of ingredients to customers. Fairtrade certified vanilla is grown in the shade, integrated with other crops, which in turn helps protect against erosion and deforestation. Crafted from the finest cocoa beans, our Pure Chocolate Extract embodies the uninhibited depth and flavor of dark chocolate. This extract is ideal for adding extra layers of this divine flavor to any recipe with chocolate as the base. Also, use it to add subtle distinction to a wide range of dishes, including beverages, desserts, sauces, chilis and other spicy foods. This extract pairs exceptionally well with chile peppers, tomatoes, legumes and, naturally, vanilla. It is important to note that the chocolate extract is not organic or fair trade. Both of these items are of high quality. I just love smelling them! They definitely will improve all of your recipes.